In the most recent round of AP getting in a huff about search engines and aggregators stealing traffic that they feel rightly belongs to them, there’s a fundamental problem they’re ignoring: AP chose not be in the online news business. More than a decade ago, AP made two crucial decisions: to not create a destination site and to license its content to news portals. Either of these decisions on their own would have been damaging, but the combination of the two has been nearly deadly. As a member-owned cooperative, the AP has catered to its members, which includes newspapers, radio stations and other media outlets. Even now, if you go to AP.org, news is a footnote. Contrast that with the front page of Reuters. Instead of displaying AP content on the AP-branded site, you get AP content in obscure brands like the Lake County Record-Bee, High Desert Daily Press, Citizen-Times.com and GazetteXtra.com. AP is still hosting the content, but the strong national AP brand is subsumed by a large number of brands that have no meaning outside their region. This might have worked if newspapers had assumed the role of the default home page and people sought out their local brands. Some papers, including the Washington Post and New York Times tried to create all purpose portals; those efforts have been abandoned. AP also decided to license content to online media outlets. Yahoo! was an early licensee; Google struck a deal with AP more recently. Yahoo! was able to take the AP content and create a leading news destination site without employing hundreds of journalists. Not only do Yahoo! and Google license AP content, they are doing a better job presenting it than AP. 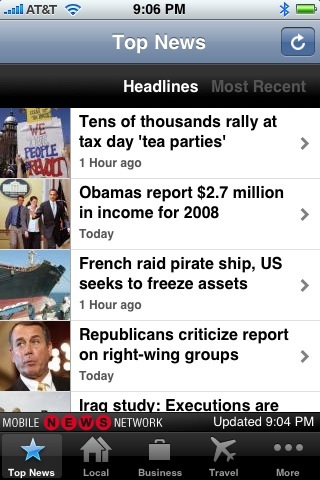 Compare this story on the AP’s site (branded oanow.com) with the same story on Yahoo! News. The Yahoo! story loads a lot faster and the layout is cleaner. On AP-hosted pages, I sometimes get pop up ads. It’s a much worse experience than Google or Yahoo! News. The fact that AP doesn’t have a destination site presents another big problem in today’s PageRank driven environment: because the same story can be presented at hundreds of different URLs, they don’t rank highly in search results. It’s not impossible for AP to get back in the game. But they have to play the game as it exists today, instead of trying to reset the calendar to 1995. They’ll need to focus on the things that any Web business needs to focus on today: simplicity, performance, community, analytics and search engine optimization. And they must do it under the AP brand. AP has a lot of assets that even now aren’t fully exploited by Google or Yahoo! With some creative thinking and Web-focused talent, they could use those assets to build a killer destination site. It won’t be anyone’s home page, but it can be successful nonetheless. This entry was posted in google, iphone, journalism, media, newspapers, yahoo. Bookmark the permalink. Hello can I use some of the content found in this site if I reference you with a link back to your site? La Regle de Jeu. There are some good rules of thumb for how to wear clothes according to your body type. The wholehearted devotion to follow teen fashion trends are considered by some as mere extravagance. What’s up, I log oon to your new stuff daily. Your wrikting style is witty, keep it up!